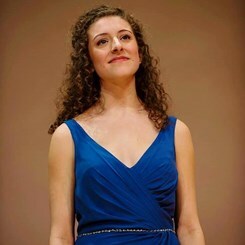 Soprano Madeline Huss is a second-year masters student at Peabody from Stillwater, Minnesota. She is a vocal performance and music theory pedagogy major and studies with Ah Hong. She graduated from Concordia College in Moorhead, Minnesota with a Bachelor of Music degree in vocal performance in May of 2016. She performed in three different opera productions in 2017: the title role of Thomas Whitman's "Sukey in the Dark," Miss Titmouse in Edwin Penhorwood's "Too Many Sopranos," and Adina in Donizetti's "L'elisir d'amore." She has been a vocalist in six world premiers, including an opera scene, art songs, and chamber ensembles. She has 11 years of piano studies and six years of vocal studies on her resume, and she has been teaching for four years. Her teaching philosophy stems from knowing her students' needs and goals. Most of all, she aims to promote healthy music making that will continue to inspire students. Request Lessons with Madeline today!